Caron is the best!!! She's the best tour guide ever. She's full of joy and positive energy. We love her and our kids love her. Our kids were captivated by her stories and fun facts about Rome. Her husband even came to drop us at Colosseum and drive us around after since it started to rain! It wasn't mentioned in the tour we would have this treatment so it's a bonus! We were so grateful to have found her. Loving every minute of our day together. We would definitely be back!!! TOUR GUIDE RESPONSE: Thank you Parada, what a wonderful review of our day. I absolutely loved meeting your family and felt so blessed to share Rome with your beautiful children. I look forward to your return so that we can fit in shopping together at the Spanish steps at Hermès. Please return soon and I look forward to showing you much more of Italy. All my very best, your friend in Rome. Súper nice, attentive, accommodating and knowledgeable guide, lots of fun and 5 star service! We highly recommend Caron! When planning the Florence/Venice portion of our trip we didn't know what we didn't know- Caron exceeded our expectations by showing and sharing with us the true Tuscan Italy. We were immersed in the culture, tastes and textures of the area. Her historical knowledge was impressive and improved our experience. We wouldn't hesitate to recommend Caron to our friends and family and will definitely book with her again when we travel to Europe. Caron created the perfect day for us- she reached out to me months before the trip,so she was sure to get us to all wanted sites! I was traveling with my 23 year old daughter and Caron provided a car which was great for an overview- and then got us to the coliseum,parthenon, and the spanish steps on foot(she haggled with a salesman so my daughter could get the perfect leather pants! )-we later enjoyed wine and pizza at a rooftop place overlooking the coliseum!She delivered us to our Vatican tour-perfecto! Caron is beyond delightful! Everything from her prompt pick up bright and early including her incredibly warm greeting, to the perfect late afternoon gelato in Sorrento was a dream day come true for my family. She brought Rome to life on our drive to Pompei, making the drive fly by! After the tour we enjoyed a fabulous wine tasting lunch in a beautiful vineyard on Vesuvius. It was a meal fit for a king! Ending this perfect day at a sunset on Almafi coast, chocolate and limoncello, and a new dear friend! My 13yo daughter&I spent a week in Rome.Caron arranged for private, 1st class events.We visited the major venues,traversed Rome&Amalfi by car while being educated.We went to Venice by high speed train.Private boat to Murano&glass blowing factory where my daughter blew glass.Doges palace,hearing the history brought it to life.Visited Villa d'Este.Caron made sure my daughter was engaged and happy.Lastly she set up a special treat for my horse loving daughter,a horseback riding event in the hills of Tivoli! Our 2nd tour with Caren and her wonderful hubby. Not only was the Rome tour incredible, but we were treated like VIP's the entire time. We had a tour booked but she was kind enough to take us out of her way so we didn't have to take public transportation after the tour. Love, love you both! Our new Roman eternal friends! TOUR GUIDE RESPONSE: It was my pleasure and I so enjoyed taking you to the old places you fell in love on the 1st trip and new places too. We feel the same about all of you! Blessed to have you in my life! I can't say enough about Caron. I can't imagine our trip here without her now! She was super helpful during the planning stages and flexible about itinerary. My daughter and I settled in for the night after a day on the town with Caron and both said "I miss her already" She knew exactly where and where not to take us. Helped us out without shame when our Roman history memory failed us. Like I say, can't imagine today without her. Told my husband "she totally made our day and this trip!" My recent trip to Rome was my fifth trip there but my first time to use a ToursByLocals guide. We loved our time with Caron. We never felt rushed, she explained many, many things about the city, and I learned and saw things about Rome that I had not experienced before. We felt comfortable with her from the moment we got in her car, and the day flew by. I highly recommend Caron to anyone visiting anywhere in Italy. TOUR GUIDE RESPONSE: Dearest Tim: I had so much fun showing you the best of Rome and more. I was the one who was blessed to meet you and to share in your moments. Please stay in touch and know that I have so much more of this beautiful country to show you! Thank you for your wonderful review and kind words, the feeling is mutual. My very best, your guide in Roma. We've traveled the world extensively and Caron is one of the best tour guides we've had.We spent a wonderful six days with her in Italy and feel like we've formed a friendship that will last forever.There was nothing she wouldn't do to make certain that we were comfortable and taken care of. She has a great personality, very knowledgeable, thoughtful and so much fun to be with. She loves her job and loves Italy.We had a fabulous time and will definitely use her again. Her service is five star all the way! TOUR GUIDE RESPONSE: The pleasure of meeting your wonderful family was all mine and I’m blessed to have spent such a special time with all of you. Thank you for allowing me to show you not only Rome but also Pisa, Florence and off the beaten track places we decided to explore. Most of all, I’m so greatful that you included me on the very special family tour of the Temple. That experience is forever in my heart and a once in a lifetime moment and memory. Looking forward to your return, you are all loved & missed. Caron is a truly superior tour guide and it is particularly beneficial to work with her if your trip involves multiple destinations. She is undoubtedly great with smaller tours as well, but we felt that having her plan a whole week for us was a great choice. When you work with Caron, you can count on seeing everything that is on your list and more, all in a very positive and family-like atmosphere. She has a unique combination of being highly organized and truly putting her heart into her work. TOUR GUIDE RESPONSE: Thank you Noymi for sharing your beautiful family with me, it was such fun planning each day and packing in as much as we could to ensure your talented and brilliant boys saw everything they wanted to and more. Your family is forever in my heart and I look forward to your return to Italy. It was a wonderfully celebrated Happy New Year with all of you. Best, your friend in Rome. TOUR GUIDE RESPONSE: I’m so pleased that you were able to get in and see the Vatican and Sistine Chapel on such short notice. Looking forward to your return to Rome to share much more. Happy New Year and safe travels home. Caron was a wonderful guide--very helpful. One of us has a knee injury, and she was extremely accommodating, helping us to manage the trip to minimize the impact on the knee. Our tour of Villa d'Este was excellent, and our lunch was absolutely fabulous, at a restaurant we would never had found without her expertise. She also gave us helpful advice as we thought through the rest of our trip. Caron was really fun to be with, and we would definitely work with her again! Executing a perfectly planned itinerary and treating us like we were the only thing in life that mattered, Caron was wonderful with our six children (ages 3-15) as she constantly engaged and loved them teaching them of all the antiquities of Italy while ensuring they were enjoying every minute of the experience. Our family has traveled to many European cities however, our time in Italy was unequaled and the difference was Caron. She is truly the best. Don't miss seeing Italy with the gem of Rome…Caron. TOUR GUIDE RESPONSE: Wow Kim! Meeting all of you was one of the milestones of my life. You are an amazing mom and Miles equally an incredible father. Thank you for the six beautiful little blessings that you shared with me to brighten my Christmas. I look forward to hearing from you all as often as possible and staying in touch to hear how the little and tall angels are growing. Please know how greatful I am that you trusted me to be part of such a special family event. You are forever in my heart - each and everyone of you! What can I say.....Caron was the best guide we've had! She's warm, funny, engaging and showed us a fabulous time in the Tuscan region. We asked about the park of monsters and no problem....let's add it to the day! Orvieto is such a fabulous town to visit and Caron made it the best! By the end of the day, we were saying good-bye to a friend....one we will certainly use again. Caron's business is global so don't hesitate to talk to her about other places in your travels. She's really the best! TOUR GUIDE RESPONSE: Dearest Patty: It was such a wonderful pleasure meeting all of you. Thank you so much for your thoughtful and kind review of our day spent exploring, shopping and tasting our way through Tuscany. I look forward to your return to me for another fun filled trip! All my very best from your friend in Rome! We took a tour of Rome for our honeymoon with Caron and she was EXCELLENT. She was extremely friendly and professional while making sure we had a great time on our tour. Not only did we get to see exactly what we hoped to see in Rome, she provided very detailed background and historical information at each stop. Along the way she also showed us some cool smaller sites that we would never have found on our own. She even taught us proper etiquette when dining in Italy since it was our first time! Wow! Wow! and Wow! The best day! Caron and her husband Mauro met us in Civitavecchia at the early appointed hour, with a big smile and a great itinerary. She is an American living in Rome, and Mauro is Italian...a great combo! They are a wealth of information. Our day was paced to fit us, and our drive through the countryside and medieval towns afforded us great vistas and a touch of the local flavor. We stopped for lunch at a wonderful truly Italian restaurant and got to sample some great recipes. TOUR GUIDE RESPONSE: Thank you Ed, it was such a pleasure to meet you and Marcia. I look forward to seeing you both again soon. Safe travels home. Caron always provided us with very comfortable vehicles to travel in. I cannot say enough about how special she is. Our family group spent 2 days touring in Italy with Caron. And all I can say is that Caron is THE BEST. She anticipated our needs at every turn to be sure each one was comfortable. We plan to spend 2 more days with her next week. TOUR GUIDE RESPONSE: Thank you Linda, the joy continues to be all mine! I am the one who has been truly blessed to share my beautiful country with your wonderful family. You are all so unique and fun to be around - I’m excited for the next round of shore excursions. Safe sailing and fair winds dear friends. Excellent!!! So happy to be in such capable hands. TOUR GUIDE RESPONSE: Thank you Linda, I’m so happy that I was able to collect everyone through the busy airport and schedule changes that occurred. So happy that we were able to get out to the ship yesterday afternoon and reconnect for the forgotten and very important medicine for your brother. I wish you a wonderful happy sailing and I’m looking forward to seeing all of you on our scheduled shore excursions along the way. Caron is by far the best tour guide ever. We highly recommend her. TOUR GUIDE RESPONSE: Thank you kindly Linda, meeting your family and spending time with all of you has been an absolute pleasure. I’m looking forward to more adventures soon. All my best to your whole family and enjoy your cruising. Blessings sent. We greatly enjoyed the tour and spending the day with Caron. She did an outstanding tour. TOUR GUIDE RESPONSE: Thank you Steve, it was my pleasure to meet all of you and I look forward to your return to my Eternal city. My very best to all of you. Where do I even start... Caron was exceptional, her service was 5 star, nothing was too hard. Caron provided the ultimate VIP experience, was friendly, bubbly, willing to go above and beyond. I could not recommend her services enough. I look forward to discovering more cities with her in the future. TOUR GUIDE RESPONSE: The pleasure was all mine and will be mine in the future to share many more beautiful places and experiences with you Travers. You really are an exceptional person inside and out who bares a deep perception for life and all it can be. Thank you for your kind review of our time spent exploring the Eternal city and beyond. My best wishes and sincere appreciation. TOUR GUIDE RESPONSE: All I have to say is WOW and Don’t stop believing! What a great day it was and so many memories were made. Please come back soon dear friends! All my best and thank you for choosing me to show you all the best of Italy!!! We had been told by our friends to "Take A Boat to Capri‼️" Our guide Caron took us on a boat to Capri AND A LOT more!! We got to see Capri up close with Caron! Caron, and her personal local friend, "Captain Costanza," got us inside the Blue Grotto. It was UNbelievable! When we got back to the shore of Capri, we took a beautiful car ride up the mountain of Capri & we got to tour the Gardens of Augustus on the south side. It was Breathtaking!! It was unforgettable! Our group of four had a fantastic day in Rome with Caron! We started with a tour of the Vatican which was amazing! On the way to the Vatican, we told Caron that we had already toured the Colosseum and wanted to try something different. Caron arranged for us to go to Tivoli for the afternoon. We ate lunch at a beautiful spot overlooking the falls and next to Roman ruins. We toured the town and the Villa d'Este. Amazing views toward Rome! What a surprise and it was so fun to spend the day with Caron! TOUR GUIDE RESPONSE: Wow Scott & Super Sue!!! 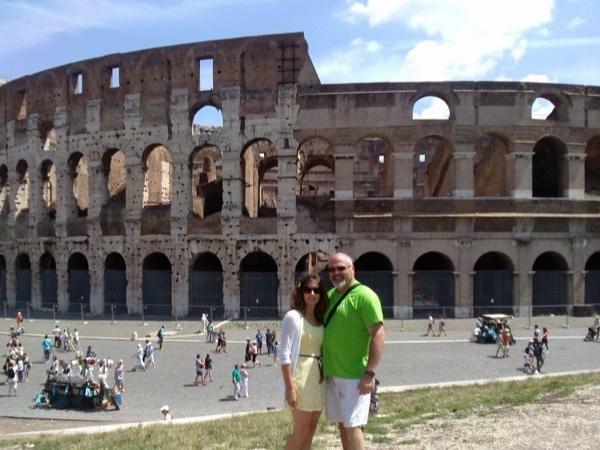 It was so much fun spending time showing you the best of Rome and more. So enjoyed meeting Eric and Cathy, getting to know all four of you was a true joy and life connection. Thank you for your kind testimonial about our time together, but the pleasure was all mine. Sending you all my sincere thanks and blessings. Looking forward to your return in May, 2019! We have traveled around the world and not found a better guide. She is very knowledgeable, organized and charming. Best tour guide ever. Caron provided our group of nine with an unforgettable day in Rome. She's an absolutely delightful person who exudes a love of life and Rome. She did an amazing job keeping our diverse group (age range 15-60, some in Rome for the first time, others on their third and fourth trips) engaged and happy at all times. Knowledge of the city was amazing. In addition to the Vatican and Colosseum, she showed us some intriguing lesser-known sites. I would recommend her in a heartbeat. Caron and her team our wonderful. Very knowledgeable, efficient, friendly, and just fit right in like one of our family members. She helped us avoid long lines and also took us to some hidden gems we were never found on our own. She went above and beyond helping us I was traveling with my mother, my aunt and family friend and we had a great tour. I highly recommend her! TOUR GUIDE RESPONSE: Thank you MARYANN! Please come back, much more to share with you! Caron is not only knowledgeable, professional, exuberant, and thoughtful, . . . she's incredibly fun and funny. My husband, daughter, and I had the most fabulous day with Caron and her driver, Fabrizio. Our wishes were her command and she made our daughter's dreams come true. Caron anticipated our every desire, went out of her way to accommodate a last-minute request, and made us feel like stars in our own Roman Holiday. I cannot recommend her highly enough. Wow! I absolutely loved this tour. Caron really knows how to show the beauty of Venice. This tour surpassed my expectations on so many levels, we all enjoyed it. We had 3 kids and 2 seniors in our group and Caron was very understanding to their needs. The tour was very comfortable and didn't have that very fast pace feel that you get on many other tours. We were able to see and do everything that we wanted and Caron always made sure that no one was left behind. Thank you again Caron for an amazing tour! TOUR GUIDE RESPONSE: Dearest Franco! Thank you so much for sharing your family with me, I fell in love at hello! The children are so precious and full of little personalities- you are blessed. I really enjoyed showing you the best of Venice and thank you for taking my advice about all of the ways to stay out of the heat and rest along the way for your parents. I so enjoyed being your local guide and hope that you stay in touch and come back soon. Let me know when your Murano glass arrives, I’m sure it’s beautiful! We had an absolutely fantastic day with Caron in Rome! She was an A+ tour guide. We were able to see everything we wanted to and more. No waiting in lines and she even reserved a table for us at an incredible restaurant that looked right at the Colosseum! We will be talking about our amazing day in Rome with Caron for a long, long time. We highly recommend her and will absolutely tour with her again in the future. Thank you again so much for such a special day. TOUR GUIDE RESPONSE: Ohh Lisa! Thank you so much for this wonderful review, but it’s me who was blessed to spend the day with your family. I’m so happy to hear that you are coming back to me and look forward to showing you much more of my beautiful country!!! All my best dear friend. Caron made our two day tour one for the memory books. She was engaging with our children and really made them fall in love with Italy. She was able to encorporate site seeing, historical facts, children's activities, and relaxing times all in a short time. She had everything planned and the transportation went seemleasly. She also was able to adapt when things took a bit longer than expected at one point. Caron was very responsive to messages. It was a blessing to have been on this tour with her! TOUR GUIDE RESPONSE: Amanda, I’m the one who was blessed to be with your beautiful family. What a joy to meet all of you and spend time showing your beautiful children the joys of Rome & The Amalfi Coast. I’m looking forward to your return to Auntie Caron’s Villa to enjoy many more good times together. My very best wishes to each of you. TOUR GUIDE RESPONSE: Thank you Erica ; ) it was such a pleasure meeting you all! Please come back dear friend. I came to Italy with my family members we were picked up in a big comfortable bus right from our hotel and had a a great time touring the lost city of Pompeii from there we had a beautiful delicious lunch in Sorrento where we tasted the homemade lemonchello and watched mozzarella being made. Caron was an amazing tour guide keeping the tour livley and entertaining. We were droped off at our Villa on the Amalfi Coast. ToursByLocals was very accommodating we had a great day!! Caron's love for Rome is contagious. She has a great personality and showed us many places in Rome that we had not seen on a previous visit. Our twelve-year-old granddaughter said that the pizza making and gelato making class was her favorite part of our trip to Rome. We highly recommend this tour with Caron! TOUR GUIDE RESPONSE: Thank you Penny, it was a true delight to meet all of you and I look forward to having you back in my Eternal city again. Your friend in Rome. Caron was excellent! We learned a lot we wouldn't have without her. She's a wealth of knowledge and so kind and funny! I highly recommend Caron for any tour or excursion!! Thank you Caron! TOUR GUIDE RESPONSE: It was such a beautiful day and I felt blessed to share our eternal city with you and the girls. I’m looking forward to your return to Italy dear friend and having many more exciting experiences. All my best and thank you for choosing me as your guide. Best always, your friend in Roma!! I'm so happy that I booked this tour with Caron. She helped navigate us through the crowd and knew exactly where to sit so we would have a great view! She also translated all that was being said. She felt like a great friend! Thank you Caron! TOUR GUIDE RESPONSE: It was such a beautiful day and I felt blessed to share our holy city with you and the girls. I’m looking forward to your return to Italy dear friend. Thank you for choosing me, I’m blessed. Caron is more like a friend than a guide! She was always cheerful and ensuring we were comfortable, our tours were relaxing, and our teenagers were happy. She is very knowledgeable. The sites were spectacular and the history amazing. She is very professional, has years of experience, and great contacts so we enjoyed the best experiences and avoided wasting time waiting in lines. She also joined us for a wonderful lunch and introduced us to fabulous Italian dishes and wines. Our tours were unforgettable! TOUR GUIDE RESPONSE: Thank you Stacy, I was blessed to show your family the best of Florence and I look forward to your return to me in Italy for some additional memorable family moments together. Please stay in touch and come back soon. Caron is more like a friend than a guide! She was always cheerful and ensuring we were comfortable, our tours were relaxing, and our teenagers were happy. She is very knowledgeable. The sites were spectacular and the history amazing. She is very professional, has years of experience, and great contacts so we enjoyed the best experiences and avoided wasting time waiting in lines. Caron also joined us for a wonderful lunch and introduced us to fabulous Italian dishes and wines. Our tours were unforgettable! TOUR GUIDE RESPONSE: Stacy the pleasure was all mine! Your family is a jewel that I so enjoyed meeting and showing the fantastic sites and flavors of Venice! Please come back and stay in touch. Your friend in Italy!!! We left Rome for Pompei, when outside the ring, we mentioned we loved wine tasting. On the fly, Caron changed directions and took us to a fun filled day in Sienna and a great wine tasting location. Private room, special meal, meeting with the owners. She was so much fun to be with, and left us with a great memory. If you have the chance to book with her, she is a must. We had over 6 tour guides during our trip to Europe and without a doubt Caron was the most personable. Her knowledge for an American living in Rome was amazing. It was nice to see the highlights of Rome with an experienced tour guide who was able to explain interesting sites from an American point of view. Great job Caron! We look forward to seeing on our next visit to Italy! TOUR GUIDE RESPONSE: Words cannot express how greatful I am to be your passport guide to Europe. Love your beautiful family and feel blessed to have spent nine great days & nights showing you the best of it all. Looking forward to our next adventure ! All my best dear friend. Caron was absolutely amazing. Our tour the original guide cancelled. Caron was substituted and we were extremely LUCKY. Caron was unaware of my physical limitation and that the tour day was my husband's 75th birthday. She did everything to make this day special. She walked slowly to accommodate my pace, carried water and even took pictures of us. She got my husband a fantastic chocolate cake and rearranged things so we could visit Tivoli. It is worth changing your date to book Caron! Caron M, a wonderfully engaging US expat guide, picked us up at out hotel and had already arranged for the necessary tickets. She knew a perfect place for us to wait until the square was opened and then moved us along to a place right along the barrier. Pope Francis (in his Popemobile) actually stopped right in front of us - an amazing experience. Thanks go to Caron for making such moment even more memorable. Having Caron arrange things made for a super easy way to get to see Papa Francesco. TOUR GUIDE RESPONSE: Thank you Jim, it was my pleasure to spend this special moment with you. The pictures of Papà Francesco giving us the blessing over our heads are a wonderful momento of our time spent waiting for him. Say hello to your kitty’s for me and your beautiful and dear wife. Caron M was our guide for this amazing tour. She picked us up at our hotel and drove us to the town of Tivoli. Once at the Villa d'Este it was wonder after wonder. Caron knew the history of the place and was obviously quite familiar with the gardens and fountains. An enjoyable and educational way to spend a morning. Afterwards Caron took us to a magnificent restaurant for a fantastic lunch. The tour was fantastic as was our guide. She has a sparkling personality and a wealth of knowledge. Caron was a remarkable guide. Her ability to make Siena, Orvieto and San Gimignano come alive for our party of four, ensured we had an unforgettable day. She is a warm , friendly, communicative and fun-loving experienced traveler and made all of us feel comfortable and relaxed about the trip. We would select Caron as a guide without hesitation on any future trip. The day was well planned and highly enjoyable. TOUR GUIDE RESPONSE: Thank you Katherine , I so enjoyed meeting all of you and sharing the hidden gems of Umbria and Tuscany. I look forward to your return trip , as I have so much more to show you. My very best, your friend in Rome! You must book your tour with Caron M. VIP treatment throughout the day. She got us from the ship to Rome in plenty of time for gelato before we saw the Vatican. We had lunch across the street from the Colosseum -WOW is all I can say. We were able to see both the Vatican and the Colosseum in one day because of Caron. Everything was beyond our expectations - she took the time to get to know us and by the time she dropped us off at the port, we felt as if we were saying good bye to a family friend. TOUR GUIDE RESPONSE: Thank you Sam : ) I enjoyed sharing my Eternal city with you. Come back soon to see much more! TOUR GUIDE RESPONSE: Dearest Caroline, my sincere thanks to you for choosing me. I just adored getting to know your parents and it was a blessing and my absolute pleasure to help them get as close to the Pope as possible. What loves they are and I’m so pleased that they enjoyed this very important life experience and our day together. May God Bless then and hold them dear, as I do. I look forward to meeting the rest of your family on your next trip to Italy. Thank you for your kind words and review of our day. TOUR GUIDE RESPONSE: Thank you Mary! It was such a pleasure meeting both of you fantastic ladies! I look forward to your return for certain. DO NOT SEE ROME FOR THE FIRST TIME UNTIL YOU'VE READ THIS REVIEW! I thought the Rome tour prices were too expensive. I mean, $800-$1500. Really? As a tourist, I'm telling you it was worth every penny. Best decision ever was to have Caron be our guide. She is a great driver and that's saying a lot in Rome. The lines at the Colosseum were about 1/4 mile. She took us right to the front. We would have waited 3 hours. We didn't wait 3 seconds. WOW! Learned so much. So, so, so great. Caron is the best! Caron is one of the best! She is professional and complete in tours. Our experience was on the fast track and she accommodated our group with ease. She is friendly and FUN! I think my family is ready to adopt her! TOUR GUIDE RESPONSE: Thank you my dear Susan! Words cannot express my graditude for choosing me, I was blessed to meet your family and loved showing you all the best of Rome, Tuscany and Venice in 5 days. Please do stay in touch and come back soon. You are all in my heart! Caron was great with every detail !! We were traveling with my parents and kids, 3 generations together and she took care of all of us, making our day in Venice extra special. Thanks again for an awesome tour, even though we had limited time. TOUR GUIDE RESPONSE: Thank you Nim! It was such a pleasure meeting your family and I so enjoyed showing you all the hidden gems of Venice!!! I look forward to your return and showing you much more. Hugs to all the children and your beautiful mom and dad. Caron is a great tour guide. She is very professional and fun to be with. She had our tour itinerary and tickets lined up for us to minimize any lost of time due to long lines. We visited 5 ancient locations and she was well informed on their history. At the end of the tour we felt that Caron was a long time friend. Thats how she made us fell. I would highly recommend Caron to anyone who is looking for good tour guide. A trip of a lifetime and Caron made it exceptional each step of the way. She was a pleasure to deal with at every aspect and we can't wait for our next trip with her. WOW! This felt like a visit with family more than a tour. Caron took us all over and made sure we enjoyed ourselves at every turn. We benefited greatly from her ability, her local and site knowledge, her language skills and her instincts. She was a tremendous tour guide but a better friend. We felt like we had been with family the whole time. Even though this was a long day due to the 3.5 hour train to and from Venice Caron made our last day in Italy a memorable one! After 3 days of tours with her, she is so personable and caring I feel like I've known her for months not days. I am looking forward to coming back to Italy just to have her as my tour guide again! TOUR GUIDE RESPONSE: Ohhh Laura! I felt the same way and so enjoyed getting to know both you and your wonderful son Reese. I really enjoyed showing you the best of Venice on your last day and look forward to you returning to Italy for much more fun, adventure and girl time. Happy New Year Beautiful! TOUR GUIDE RESPONSE: Thank you for your kind review Laura, I know we packed it in and then some during this tour and I was delighted that both you Reese enjoyed the day. I know it was tough doing all we did after a very long Cruise. Caron was wonderful upon first meeting! We were tired from our cruise but she had no problem going at a slower pace our first day with her. TOUR GUIDE RESPONSE: Thank you Laura, it was my pleasure to spend the day your way. That’s what Tours by Locals is all about, making certain that your tour is quality and that it flows the way you wish. Thank you for your kind review, I look forward to your return with Steve and Reese. Caron and her husband gave us an amazing insight on some less known areas of Rome (even with the closures on New Year's Day). A very informative tour! TOUR GUIDE RESPONSE: Thank you kindly Giancarlo, we so enjoyed meeting all of you and look forward to showing you much more of Rome when the city is more accessible. Your patients and understanding of the closures were above and beyond! Wishing all of you a very Happy New Year! Caron was absolutely awesome. I I can't recommend her highly enough, she went totally above and beyond the call of duty to give our family a great experience. 5 stars!!! TOUR GUIDE RESPONSE: Thank you Steve! The pleasure was all mine and I look forward to having your family back in Italy for more adventures. TOUR GUIDE RESPONSE: Thank you dear Rhona! I so enjoyed meeting both of you and showing you the beauty in Italy that you both wanted. Please come back to Italy soon, as I have much more to share with you. Happy New Year!!!! TOUR GUIDE RESPONSE: Thank you for your review of our tour together. I apologize for the confusion on your booking and wish you the happiest of holidays. TOUR GUIDE RESPONSE: Thank you Roger! Really I so enjoyed spending time with you both and showing you Rome. The concert was just a wonderful extra and a joy to ensure that you got there safely and returned safely. You and Nancy were a joy and I look forward to your return to me in Italy soon!!! Happy Holidays to both of you! Caron treated my wife and I like life long friends when we met off the ship. We highly recommend her. Our tour of Venice was enhanced by great weather and Caron's ability to use our time wisely. The visit to Murano glass factory was a highlight! TOUR GUIDE RESPONSE: Thank you Roger, the pleasure was all mine to meet both of you and share with you the beauty of Venice. The photo’s we took together throughout the day are a testimony of the fun we had and the special places we explored. Looking forward to seeing you both in Rome. Blessings to both of you. We always felt safe; we were never rushed, and our two girls, aged seven and nine loved her. There was never any waiting because we skipped lines because of Caron's knowledge of the ticket system and we easily got in and out of her private van in locations that a bus never would be able to go. Her English and Italian are excellent and her genuine love of Rome and its history is evident in everything she shared with us. Caron is a real gem and we would highly recommend her! TOUR GUIDE RESPONSE: Thank you Charlene for your wonderful review of our day spent touring the Eternal City. My only wish would have been to spend ore time with your beautiful family in each of the ports you stopped at. I so enjoyed meeting all of you and the girls are a parents dream come true, adorable! I cannot wait for your return to Italy, I have so much more to show you! Caron and Mauro not only are terrific tour guides, but we also got to stay at their villa, which they use as a B&B. Mauro is a former chef, and we got a wonderful dinner of pasta followed by baked sea bass. Their villa was very comfortable, and they are extremely gracious hosts. We couldn't ask for anything better! TOUR GUIDE RESPONSE: Thank you Bob, we so enjoyed sharing the villa with you and Mary. It was our pleasure to show off Mauro’s cooking skills too, glad you enjoyed it. That 3:45 am run to the airport with coffee in hand was a fun ending to meeting both of you. We look forward to seeing you next year!!! Caron and Mauro were very flexible with us, as we decided to just take a driving tour through the countryside and stop at a winery in the area for some local wine and some local cheese, and then drive on to Orvieto, where we found some terrific ceramic ware, got a nice tour of the town and the cathedral there. Their knowledge of the area and their flexibility to change at the last minute to do what we wanted was outstanding! TOUR GUIDE RESPONSE: Thank you Bob, I so enjoyed showing you all of the off the beaten path wineries in the Umbrian hillside on our way to Orvieto. Happy that I could change things up for you to make you both happy about your touring day. We were lucky to have Mauro driving for us so that I could focus on sharing all of the local places and information when we stopped along the way. Can’t wait for your return next year!!! Caron McConnon met us at our cruise ship first thing in the morning, gathered us up, and off we went on a day-long tour of Rome. Caron was great, and got us in an out of the places on the tour while thousands of tourists waited in line. she is very informative, and we got to see some really interesting things. Caron is quite knowledgeable and we had a great time. TOUR GUIDE RESPONSE: Thank you Bob! It was such a pleasure meeting both you and your beautiful wife Mary. Rome wasen’t built in a day, but we sure did see as much as we could ; ). Please plan on a return trip as I have so much more to show you. All my best & many thanks for choosing me. My family and I spent 2 wonderful days with Caron in and around Rome. We visited Villa d'Este and afterwards ate a lovely lunch at a local restaurant. The next day, we made pizzas and gelato. The kids enjoyed learning the secrets to make the best pizza and gelato. She's knowledgeable, professional and friendly. I would highly recommend her. TOUR GUIDE RESPONSE: Grazie millie !!! The pleasure was all mine. TOUR GUIDE RESPONSE: Thank you Traci! I so enjoyed meeting your family and cannot wait to see all of you again soon. I wish we had known about Caron before we booked other tours in Rome! Caron went above and beyond to show us Florence and San Gimignano. Starting with picking us up at our hotel in Rome to setting up an impromptu lunch feast at Tenuto Torchiano Winery, Caron handled it all with ease. There was no way we could have driven or taken a train to Florence from Rome. Caron was knowledgeable, organized, and a lot of fun to be with. We made a friend and miss her very much. TOUR GUIDE RESPONSE: Oh Jeanne, it was my pleasure to meet and spend time with both you and Mac! The joy in showing you all of the items we covered that day including the hill towns of Tuscany was really fun! I'm so pleased to know how much you appreciated the winery, the cheeses that we tasted in San Gimignano and all of the history we passed along the way. Thank you for allowing me to enhance your experience in real time and know that there is so much more to show and share with you both!!! Thank you for choosing me!!! We have just returned from Italy where we had a superb time. We are a family of five, 2 adults and 3 children. For two days, we had as our guide, Caron. First day Rome, second day Amalfi Coast and Pompeii. We can categorically say that Caron is the personification of "Putting the client first" and "Nothing is too much trouble". Caron's capacity for strategic planning of the best use of our time was excellent. Vatican, Sistine Chapel, Catacombs, Gladiator School, Colosseum. What more could you want? We were so pleased to find Caron, being an Expat, but also with dual Italian citizenship (15 years) that we could relate to and learn what it's like living in Italy. Caron is very friendly, very knowledgeable and expresses a genuine interest in you and what you're interested in seeing while in Italy. After 3 busy days in Rome, we wanted a slower pace and was pleased that Caron had time to take us on an all day relaxing, tour of Pompeii, Sorrento and the Amalfi Coast. Lunch in Sorrento was the highlight! TOUR GUIDE RESPONSE: Thank you Mr. Tyner for your kind words regarding our day on the Amalfi Coast together. It was such a pleasure to meet both of you and engage in such interesting conversations during the drive. I look forward to your return to Italy in order to show you much more. Grazie!! My day with Caron exceeded my expectations. Pompei was timed beautifully so it was less crowded, we had a lovely relaxing lunch on a farm at Sorrento, a bit of shopping and then of course the amazing trip down the Amalfi Coast. SUCH stunning scenery. Caron was a great host, relaxed, good fun, easy to chat with and very accommodating to my wishes. She clearly has a good rapport with the locals and is a safe driver. I would highly recommend her for this or any other trip. TOUR GUIDE RESPONSE: Thank you kindly Fiona for your wonderful review of our day. It was such a pleasure meeting you and exploring the Amalfi Coast through your eyes. I'm so pleased that it was the day you had hoped for and more! That is what the Tour's by Local's brand offers you in each city you visit, unique experiences. I look forward to your return to Italy so we can share more adventures together. Grazie Tanto!! To have Caron show you Rome is like having your best friend show you her town! She makes you feel comfortable and well tended to at once. Her knowledge, enthusiasm and warmth were exceptional. Treat yourself well and spend time seeing Rome with Caron. TOUR GUIDE RESPONSE: Thank you so much for your kind words my dear Jan. What a special night it was meeting both of you. Your photo taking skills are beyond a master and I so enjoyed learning from such a pro artist. Please come back and my best to both of you. Caron wad amazing!! She spent 3 days with us in Italy, picking us up at the cruise port and driving us to all the important sights in each port. She was amazing at making sure we got to see the things that were important to us. She fit in with our crazy group of 4 perfectly! She definitely made our vacation memorable! We truly felt like we were being guided by a friend. We have a new friend in Rome for sure! Thank you so much Caron for all you did for us! We love you!! TOUR GUIDE RESPONSE: Thank you so much Michelle! Your Kind review of our time and getting to know each other in just a few short days is so good to know because I felt the same way. I so enjoyed each and every port city with all of you! Come back to visit soon, I'll be waiting to greet you with hugs. Caron is an amazing tour guide! We had an absolutely wonderful time in Pompeii and Sorrento. With our group of 3 generations friends and family, Caron made sure everyone from Grandparents to the 1 year old had a blast. Her expertise on the locations we visited and overall knowledge kept us asking a million questions. It feels like a friend you have known forever just picked you up and shared their neighborhood! We especially appreciated the family farm experience -- unique and fascinating culture. TOUR GUIDE RESPONSE: Dear Valerie, it's you and your loved ones that blessed me with your attention and interest in each location we visited. I'm excited to start planning your next visit to Italy, as I have so much to show you all. My hugs and kisses to little London, as he was the highlight of our day. Thank you for sharing all of your treasures with me. i cannot gush enough about how wonderful caron is or how much she meant to our family on our trip. not only was she an amazing, knowledgeable tour guide, but our two small children just fell in love with her! caron knows all the cool, hidden little shops, restaurants and sites. she is patient, accommodating and just all around a great person and your guide. we miss her already! TOUR GUIDE RESPONSE: Thank you so much Ian for your kind and warm words regarding our days spent together. You have the MOST INCREDIBLE FAMILY and I so enjoyed being with both your Prince and Princess. I look forward to keeping in touch and seeing you all again in the near future. Happy to be the kids, Roma Nonna! Without reservation I can say Caron was the best guide I have ever had overseas. She is fun, intelligent, personable, flexible and helpful. I give my highest recommendations and compliments. TOUR GUIDE RESPONSE: Wow David! Thank you for bestowing me with such an honorable review. It was such an immense pleasure meeting your family and I'm so greatful to have shared my beloved Rome and her surroundings with such interested traveler's such as yourself, Micha and Michelle. My sincerest wish is for you to return to me in the near future for viewing additional sites around my beautiful adopted country. Grazie Millie!!! Wow, we set the "Off the beaten track" tour up spontaneously after our tour of Ancient Rome and it was an unbelievably great day. Caron's energy, knowledge and love for Rome was fantastic. Even though it was a rainy day in Rome, we hit places ink Rome we had never heard about but that were so memorable in our journey. The Tivoli Gardens, Catacombs, and Key Hole are can't miss. She did so much, including ensuring dinner reservations, scheduling drivers, and ensuring our Rome visit was perfect. TOUR GUIDE RESPONSE: Wow right back at you!!!! Thank you Ted for booking me and not cancelling on such a rainy day. It was my pleasure to show you everything and more that this Eternal City has to offer. Tivoli Gardens was the plus that you all deserved and I was delighted to share. I look forward to hearing from all of you for our next kindered spirit tour of the Adriatic in 2018. Grazie Tanto a tutti! Excellent tour, excellent tour guide. Highly informative. Able to see sites we didn't expect to see. Recommended to all. Thanks Tours by Locals. TOUR GUIDE RESPONSE: Thank you Janis. I really enjoyed showing you all the little hidden places in Rome. I look forward to your return. Caron is the most friendly,warm & knowledgable guide I ever had ! She was on time for our "Day Trip to Florence". We had such wonderful, terrific experiences with her. Be it visited San Gimignano, wine testing or tour Florence. She was like a family member/old friend we all enjoyed spend time with. We laughed, sang, wined and dined . By the end of the day, we already planned to meet again - just like family/old buddy would. I wholehearted recommend Caron to anyone visit Rome. A BIG 5 star caliber !!! TOUR GUIDE RESPONSE: Thank you dear Frances! It was such a pleasure to meet all of you and I so enjoyed showing you Florence and the vineyards of Tuscany. I am so delighted and blessed to know that you consider me and our time together as if you were with a friend as I felt the same with all of you. Please return to me in Rome soon!!! Caron was a delightful tour guide! She is very committed to customer satisfaction, and makes every effort to ensure that her group is comfortable and enjoying their excursion. Caron is now a friend to us, she has been so kind to offer advice for the rest of our journey, and checks to see that we are having a good trip. We look forward to working with her again in the future and have already encouraged others to get in touch with her for their future travels. TOUR GUIDE RESPONSE: Thank you Vicki! I really enjoyed getting to know your family and friends during our tour. We have so much more to explore together and I look forward to your return to me in Italy! Caron picked us up at the port and away we went. She was AMAZING at telling us Rome's history, engaging us in conversation, making us feel like old friends, making the entire tour - EXCITING, FUN, INFORMATIVE, INTERESTING, and showing us Rome from every possible viewing vantage point. We came, we saw, we ate, we laughed and we had a ton of fun with a most engaging host! Thank you Caron you are truly "THE BEST" AT WHAT YOU DO! We will never forget our beautiful tour and time with you! TOUR GUIDE RESPONSE: Thank you Marty! I'm the one who was blessed to have been chosen by two wonderful spirits such as you and Jasmine! Your very kind overview of our day together is what I strive for as a professional guide each and every day. The feelings are mutual and I look forward to having you both back again in Rome for more excitement, fun and adventures together. My BEST to you both! Caron was on time to meet us at the airport and get us directly to our hotel after a very long journey. She was able to describe many interesting facts on the trip and was helpful in suggestions for later in our holiday. TOUR GUIDE RESPONSE: Thank you kindly Mr. Boucher. It was my absolute pleasure to greet you on your entry to Italy. Wishing you a wonderful cruise and come back soon! Caron is a thoughtful, friendly and knowledge lady. We had a wonderful day with her at Rome today. The kids love her so much! Caron was excellent - friendly, accommodating, funny and knowledgeable - the perfect tour guide. She was especially good with my four children and gladly arranged some impromptu beach time for us that was the highlight of the day. Heartedly recommend Caron and would happily book with her again. TOUR GUIDE RESPONSE: Thank you Todd for your kind words. I so enjoyed meeting your family and was blessed to spend time with your children. Looking forward to meeting you again on your next Italian adventure!! We had planned a day in Rome which meant a drive from the ship into the city. Caron clearly did not want ro drive to Rome and said that it was crowded and extremely hot and that the tourists were "dropping like flies". We felt steered to go to other towns as we had all previously been to Rome. The day was a disaster as we ended up driving around aimlesly and seeing a lot of nothing instead of seeing the areas we wanted to see in Rome.She was not able to answer many questions. Very dissappointing. Awesome experience, Caron took us to places that you would never know about or experience. Our guide was very knowledgeable not only about the tour but all of Italy. Caron went out of her way to make our experience a relaxed enjoyable. Thank you Caron! TOUR GUIDE RESPONSE: Thank you Richard! It was a joy showing you a fantastic day on the Amalfi Coast! I'm waiting for your return to our Paradise. All my very best! This was an unbelieveable tour for us. Caron was outstanding and was willing to do whatever made us happy. We saw in one day more that we had imagined possible before returning to the ship. Our group of four (two couples) felt that we had become more than clients - more like a friend showing friends her city. Lots of laughter, wonderful insight into history, and a sense that we were well taken care of left us with wonderful memories of a fabulous city and a new friend who lives in Rome! Caron was outstanding! Fully organized, flexible, and willing to go the second mile. Our group of four was amazed that we could see more and learn more in one day than we could have imagined. TOUR GUIDE RESPONSE: Thank you Scott! It was such a pleasure to meet all of you and I look forward to your return to me for many more adventures together! You're the BEST! This is a wonderful tour and Caron is the tour guide to arrange it! We met early in the morning with a breakfast in the Vatican courtyard. Our Vatican guide, Roberta, was friendly and knowledgeable. She was able to provide so much information on such a personal level. Then it was off to the other sites like the Colosseum. 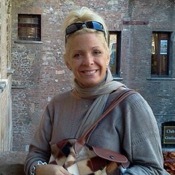 Caron may be an ex-pat from the U.S. but she knows more about Rome and Italy than most Romans! My only regret is that we didn't have Caron plan our entire week long trip Italy! TOUR GUIDE RESPONSE: Grazie Millie Pamela! It was wonderful meeting your family and showing you the best of the Eternal City. I look forward to your return and please remember that Travel is the one thing you buy that makes you Richer! So I cannot wait to see you all again and soon!!! All my best!